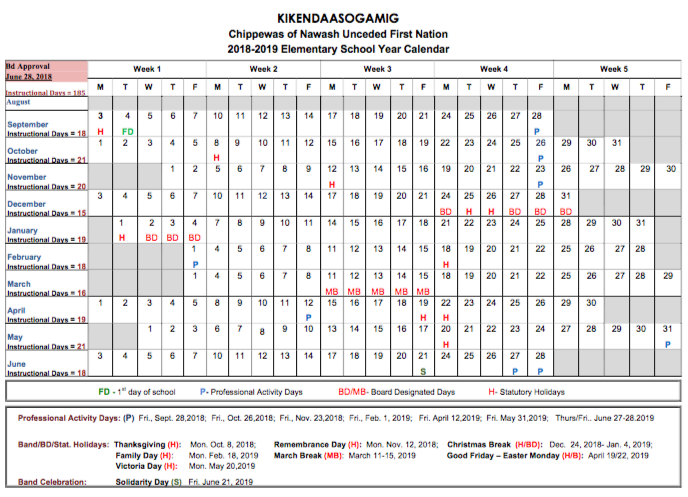 The Kikendaasogamig Elementary School provides education for Junior Kindergarten to Grade 8 students in our community. We strive to offer quality education to enable our students to become successful First Nation community members and global lifelong learners. In partnering with the community and parents we provide the best of our teachings and language to aid our students in developing Anishinaabe Pride. We offer Ojibway language classes and take measures to incorporate cultural education in our school. We also have various mainstream special education programs. In addition, we also provide a "Daily Breakfast" program and a "Hot Lunch" program for the winter months.